I recently bought a 2007 Surveyor SV 235RS that is not getting any 12V power to the trailer from the tow vehicle (2004 Ford F-250). I have confirmed a 12V source at the truck plug with a multimeter, everything should be good at the truck end. Inside the trailer with no battery or a dead battery, no lights work and I cannot operate my rear slide. Further, I am also not getting any power to my trailer battery to charge it when I drive. I have read on this forum that there should be a fuse on the trailer side under the hitch for the 12V power, however, I cannot find it. I also cannot find where the 12V lead goes into the trailer to try and check any other fuses or loose connections. Can anybody confirm if there is a fuse at the trailer hitch or what else might be causing this? Is there another fuse I should be checking? Keep in mind that the 'fuse' near the tongue won't look like a regular fuse. It'll look more like just a pair of terminals. It could also be located in a storage compartment or near the converter. Also with no battery I don't think, even it the truck was putting the 12 volts out, that you would be able to run out your slide anyway. Way too many amps are needed and something would pop. agree, it might not pop anything but the leads are too long and too small to power much in the trailer. The lights, however, should work if by themselves. If they don't, something is wrong with getting the TV power to the rig. Look for a 4" electrical box that your 7-pin harness comes into. Open that up and there should be a standard 30 amp fuse in there. Had same problem few weeks ago. Put a resettable fuse/circuit breaker in its place so I would never have to fix it again. Might as well check the connections on the two post circuit breaker that will be next to it. Do your outside trailer lights work? When I went to pick up my trailer from storage this spring, I had the same thing happen. It seemed like no power to the trailer, the tongue jack wouldn't work, etc, but the brake lights and turning signals worked so I drove it home. I tested everything, fuses were good and it seemed like there was no reason it should not be getting power. I cleaned the contacts and it all started working again! 2015 F150 Lariat Supercrew 3.5l EcoBoost. Used to tow with 2006 F150 XLT Supercrew 5.4l V8. The EcoBoost is so much better! Yes, everything works when connected to shore power. When plugged into shore power, I have ~12 volts running back to the battery leads that charges the battery (confirmed with multimeter when battery disconnected). If so, all fuses in here appear to be fine. Is there another fuse between here and the 7-pin plug? I see nothing at the hitch before it goes into the trailer frame, then I lose it (Picture 2 and 3). Also see nothing in the front outside pass through storage. Is there any where else that FR puts these fuse boxes in the storage compartments? No lights work (other than brake, turn and running lights) or other devices (water pump, stereo fan...etc.) work when not connected to shore power when the battery is dead or disconnected. I definitely have power at the plug on the TV (Picture 4). It's just not getting into the TT. I do not intend to run any appliances or the slide with only the TV power. I would like it to charge the battery when driving or use interior lights if needed when the battery is dead and I have no shore power. I see nothing at the hitch before it goes into the trailer frame, then I lose it (Picture 2 and 3). Also see no electrical boxes until the breaker panel. Do you know where this is located on a SV 235RS? Yes, all outside light (brake, turn and running) work fine. The plug contacts appears clean. Thanks again for everyone's help. Sorry for the long response. I need to try and trace the wiring in to the trailer. Does the paneling come out east from underneath the trailer, between the frame rails (Picture 3)? 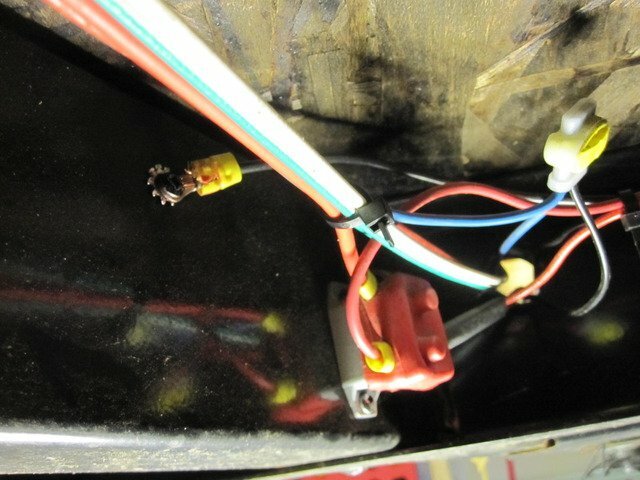 Some trailers have a circuit breaker in the red (positive) power line attached under the frame. If so, remove the red cover to find the reset button.